Discover how Operation Christmas Child shoebox gifts lead to evangelism, discipleship, and the multiplication of believers and churches. After receiving shoebox gifts, many children are invited back to participate in our discipleship program, The Greatest Journey. Through this 12-lesson course, which includes Bible stories and Scripture memorization, they learn how to follow Christ in their daily lives as they share Him with friends and family. More than 18.9 million children have enrolled in this program since 2009. After completing The Greatest Journey, children attend a graduation celebration and receive a certificate. Most importantly, they are given a Bible that includes the New Testament and selected Old Testament stories along with a dictionary of Biblical terms and a map of Bible lands. Complete with illustrations, it is often the first copy of God’s Word the child, or their family, will own. Family and friends who attend the ceremony hear the Gospel of Jesus Christ. Hearing the Good News and testimonies during their loved one’s graduation reinforces the changes they have seen in the students’ lives, and their families often come to faith in Christ. Uganda: Children rejoice at their graduation from The Greatest Journey. Since 2009, more than 8.9 million children have reported decisions for Christ while taking The Greatest Journey. These children as well as those who hear the Gospel at shoebox outreach events share their faith with friends and family—who in turn disciple others. 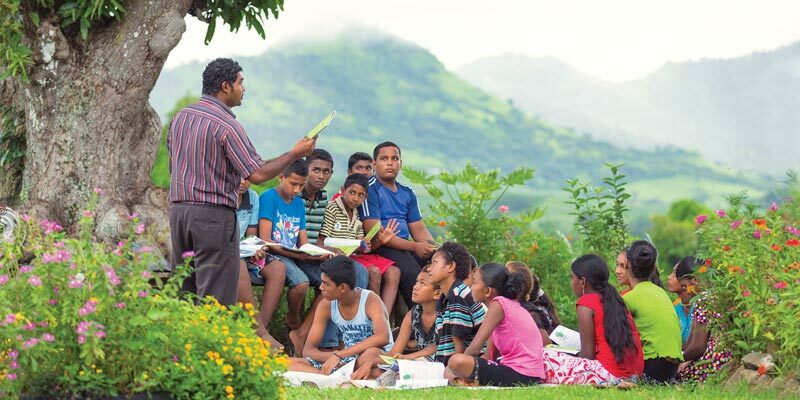 Pastor Waisea Liwaiono hosted an Operation Christmas Child outreach in Vunika, a rural community in Fiji that had no church. He then invited the children to attend The Greatest Journey discipleship program. As the students gathered for Bible lessons, their parents grew curious and began attending too. The local witchdoctor became a believer and offered his property as a place for the new church to meet. Today 80 people attend regularly, and five additional churches have been started in surrounding villages! From the shoebox packers who pray for the boys and girls who will receive their gifts to the local teachers who pray for the children who attend The Greatest Journey discipleship classes, prayer is key to the work of Operation Christmas Child. Honduras: A little girl prays to thank God for her shoebox gift. Prayer is an essential element of outreach events around the world. The Greatest Journey in the U.S.